Wikimedia, CCPublicis Groupe CEO Maurice Lévy. 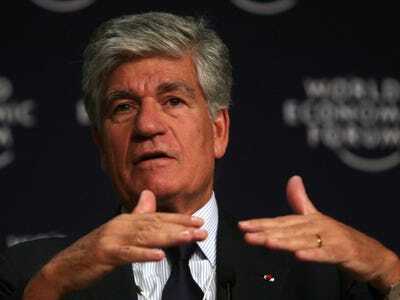 At just past 11 p.m. last night, when Publicis Groupe CEO Maurice Lévy went to bed, he was comfortably certain Britain was going to vote to remain in the EU. But when he awoke this morning at 4.a.m. he was “stunned” and unhappy to see Britain had voted — by a slim 51.89% majority — to leave. The France-based advertising CEO said he respects the “decision of the people,” but regrets that people often get it wrong. Markets went into turmoil after the referendum result was announced on Friday. The British pound fell to a 30 year low. Publicis Groupe’s stock was down 4.9% at the time of writing. But Lévy is confident the Brexit won’t have have “much consequence” on his business, which has a big presence in the UK. British Prime Minister David Cameron — who had wanted the UK to remain in the EU but had nevertheless been the man to call the referendum — announced his resignation following the results on Friday. Former London Mayor and leader of the Leave campaign, Boris Johnson, is the bookmaker’s favourite to replace Cameron at Number 10. Lévy was speaking to us from the Cannes Lions advertising festival where he had just appeared on stage alongside UN secretary-general Ban Ki-Moon and WPP CEO Sir Martin Sorrell, Havas CEO Yannick Yannick Bolloré, IPG CEO Michael Roth, Omnicom CEO John Wren, and Dentsu CEO Tadashi Ishii (via video). They were announcing that all of the “big six” holding companies were launching a joint advert sing initiative to help raise awareness of the United Nations’ 17 sustainable development goals. Next week, once Cannes is over, Publicis Groupe is opening its inaugural Viva Technology Paris expo event, which will include speakers such as Alphabet chairman Eric Schmidt and Wikipedia founder Jimmy Wales. Publicis will also announce the winners of investment from its “Publicis 90” startup fund and mentorship program. Lévy said Publicis has invested €10 million in the fund and €10 million in the event and that the company hopes to break even. The ad agency holding group has also called on partners and media companies to match each investment, which will range between €10,000 and €500,000. “The success that we are seeing [with Viva Technology] happening is such that people are already asking: ‘When is the next one?’ We will review and we will have another meeting and hopefully it will become a yearly one. We will see,” Lévy said.